This name has different local meanings. In some regions it meant normal pipes, with a simple chanter stock instead of goat's head, in others pipes without bells, or with wooden funnel-like bells as on clarinets, or with a short drone. Elsewhere it was a mouthblown form of otherwise bellows blown pipes. I brought together some of these features to create an instrument, that I, quite confusingly, put in a group of historical bagpipes. My sutky is a mouthblown three-voice bagpipe, with a commonplace chanter with two bores. The right one – hucik – has one fingerhole (kontra). It plays lower fourth when covered (with right hand's ring finger), and the tonic when open.. Abeceda, the melody pipe on the left side has 5 fingerholes in front and a thumbhole on the rear. It plays the tonic when all the holes are covered. There is a special tuning hole at the side of the chanter, for setting this bottom note in tune. The Hucik has no resonator, only a simple wooden tube with a suggestion of a bell at the end. 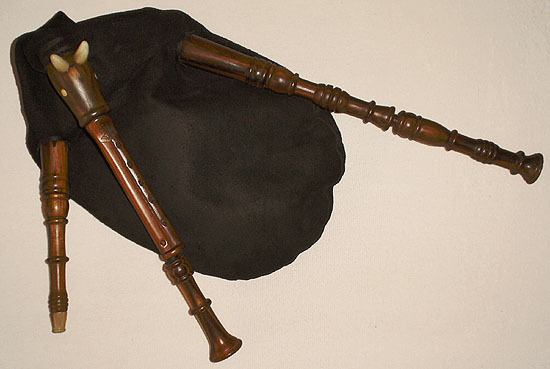 The chanter is placed in a simple turned stock, still with a cetain goatlike character to it. The drone – huk – sounds an octave downwards from the chanter's keynote. It has no bell as well. The sound is interesting, almost exotic.